Since the beginning of the fall 2018 semester, the American River College Club and Events Board has been empty except for one member: Student Senate President, Rebeca Rico-Chavez. Because of the lack of representation in CAEB, Rico-Chavez facilitates both the CAEB and Student Senate meetings. During the Associated Student Body special election on Sept. 25, no one ran for the CAEB offices and so the board has been nearly empty since. “[I was advised] to be the facilitator of the meetings until we can find someone else to facilitate those meetings,” Rico-Chavez said. Incentive points are a point system for clubs based on their participation in school activities including attending Club Day, hosting events and attending CAEB meetings. Those points are then turned into money for the clubs at the end of the semester based on the availability of funds in CAEB’s budget. Business/accounting major Tina Harboin, a representative for National Alliance on Mental Illness, said that the lack of CAEB members has slowed the progress that could be made by CAEB. “If we don’t have people in charge then we can’t do some of those things [we could do]. We are kind of limping by,” Harboin said. ASB’s budget is provided through a $1 student representation fee, which is mandatory upon each students registration, according to the California Education code. The money is then split between the two branches of ASB: CAEB and Student Senate. Brett Sawyer, student life supervisor for ARC, acts as an adviser to ASB, which means he informs both CAEB and Student Senate representatives. A joint-budget committee meets twice per semester to determine the way the money is split between the two branches, however without CAEB representation Student Senate is the sole representation for the joint-budget committee, according to Sawyer. The joint-budget committee is comprised of nine members, according to the joint-budget committee bylaws, four of which represent CAEB. The other five members are made up of Student Senate members with ASB president Rico-Chavez voting only in the case of a tie. However without representation from CAEB, the joint-budget committee will be comprised exclusively by Student Senate members. While there is no representation for CAEB, all clubs are still encouraged to attend their weekly meetings during which club representatives are allowed to vote on how CAEB funds are spent. “The more people that we have, the more things can get done,” Harboin said. Student Senate assigned a committee to run an advocacy campaign to get students at American River College involved with CAEB, according to Rico-Chavez. Along with the advocacy campaign proposed by Rico-Chavez, individual clubs are making efforts to make the incentive points program more well known by clubs so they can get more involved with CAEB. “It would be great if we had people to step up and get involved so we can have a board so we can make more decisions so we get things done for the campus and the community,” Harboin said. In order for CAEB to be more effective in making big decisions for the clubs on campus, club participation is necessary, according to Harboin. “We’re trying to get the word out on [the] ARC website and have advance notices like flyers, sending emails to clubs but it is difficult to get the word out,” Harboin said. Rico-Chavez assigned a committee which is assigned to let students know about the various ASB positions available, including the empty CAEB board, in an effort to get more students involved in representation on campus. “[Students] can run for [CAEB] president, vice president, commissioner of finance, director of activities, director of communications, public relations and a ton more,” Rico-Chavez said. 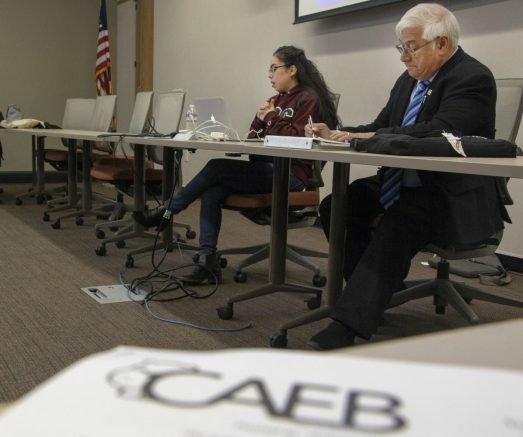 Be the first to comment on "ASB left underrepresented; CAEB board remains empty"